Synopsis: Disney’s Planes is an action-packed 3D animated comedy adventure featuring Dusty (voice of Dane Cook), a plane with dreams of competing as a high-flying air racer. But Dusty’s not exactly built for racing-and he happens to be afraid of heights. So he turns to a seasoned naval aviator who helps Dusty qualify to take on the defending champ of the race circuit. Dusty’s courage is put to the ultimate test as he aims to reach heights he never dreamed possible, giving a spellbound world the inspiration to soar. The title of the movie is Planes, so why are there more cars, trucks, and the like in the movie? This question haunted me throughout my entire screening experience watching Planes, especially since the story did not give the awesomeness of planes their rightful due. 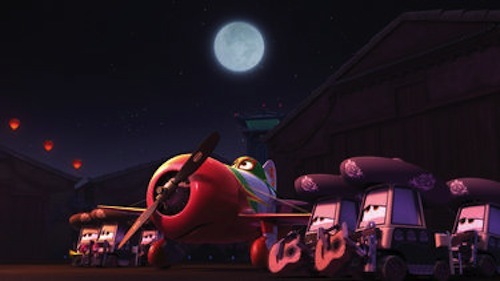 Set in the rural off-the-map town of Propwash Junction, Planes is the story of crop dusting plane Dusty Crophopper (voiced by Dane Cook) who dreams of competing in the ‘Wings Around The Globe’ racing competition. As a crop duster he’s not built for racing, and his mechanic Dottie (voiced by Teri Hatcher) reminds him of this all the time, but he’s determined to change his lot in life and compete with the fastest and slickest planes in the world. His bumbling best friend the gas truck Chug (voiced by Brad Garrett) is all for Dusty competing. Dusty gets in, barely, and with the help of retired naval aviator Skipper (who is a plane, too) he will learn how to go faster, use the wind, and overcome his fear of heights–hopefully. Yes, Dusty, a plane, is afraid to fly high in the sky. It is this fear that will put him in last place during the race as things get going, and the femme-fatale named Ishani (voiced by Priyanka Chopra) will make Dusty’s life more difficult as well. As will the bad-boy plane Ripslinger, along with his two sidekicks Ned and Zed, who is willing to do anything to win the race, including putting Dusty’s safety in danger. He also makes some friends, like El Chupacabra from Mexico and Bulldog (John Cleese) from the United Kingdom. There is not one character that stands out in Planes aside from Dusty, and his story isn’t unique enough to make him memorable. The best parts of the movie are when the planes are shown flying high in the sky, the sun setting behind them or the clear blue sky creating a haloed backdrop. The animation in Planes is top-notch, this is Disney after all, but a good movie does not come from beautiful animation, it has to have more substance than what Planes provides. There are limitations to what the animators could do with the planes in Planes because planes don’t have very many movable parts you can manipulate. The eyes, mouths and wings, plus maybe the landing gear tires, are all there is to work with. This makes for an unexciting rendering of planes coming to life–they’re just kind of there, talking, when on the ground and without any other action in the scene your eyes aren’t getting any stimulation. Get them up in the sky, in one of the fast action sequences (and there aren’t many) and the planes are fantastic to watch–then the scene ends and we are back on the ground, again. 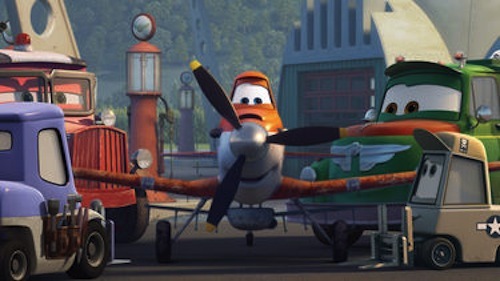 For a movie about planes there aren’t that many planes in the entire movie, just the main character and those in the race. One scene in particular, the finish line climax, shows this truth all too clearly. In the stands for every, say, five four-wheeled autos there is one plane. Its disappointing, even if it makes sense that planes need gas trucks and mechanic lifters to help them along but Planes would have been better titled ‘The Great Plane Race’ or something similar than ‘Planes’ as the title does not support the story entirely. The movie is also basically Cars in more ways than I can count, or feel the need to write. There is a definite generic, formulaic feel to Planes that will not go unnoticed by children or adults that watch the movie. Its a shame, really, as planes are awesome and can do amazing things in the sky which kids love to watch. I doubt they will love to watch Planes more than once. Planes doesn’t have to break any mold to be entertaining, or acceptable, in terms of its story. It is an animated movie, geared towards young children, and with that things just have to be set in a constant flux of motion so the children’s short attention spans don’t wander. But Planes does not provide enough of anything–humor, charisma, high-flying action, or character cuteness–to keep anyone fully engaged. Its got heart, that is for sure, and Dusty’s story of overcoming all odds to achieve his dreams is always great in a children’s film, but what about the wonderment you expect? Planes has the narrative structure needed to sustain it, it does not have anything remotely funny or enough high-flying stunning action to wow you at any point. Its not a movie that invites you to suspend your disbelief and bask in the amazing spectacle of a great plane race around the world. It doesn’t even let you experience the awesomeness of the places the planes travel to as it always sets the story in the garage, the tent, or some other boring area where the planes rest in-between legs of the race. The small sampling of the Grand Canyon and the Himalayas does not make up for the lack of style and design not included in the screenplay. Dusty’s near-death encounter in the middle of the Pacific Ocean is a very well-written and visually imagined scene in the film, and its quite short. Watching him collect icicles while flying to Iceland over glacier filled water is a yawn. Even the dialogue is quite stale in Planes, aside from when a joke is trying to be delivered, and failing. All was quiet in the screening room full of children, not a “wow,” “cool,” or laugh could be heard (there were plenty of kids squirming in their seats, though). Planes is a very undemanding movie for its audience, and that would be perfectly okay had it been funny and full of charismatic plane characters that make you want to run to Toys R’ Us afterwards and grab a movie tie-in so you can re-create the excitement at home with your children. Alas, there won’t be much to remember after watching Planes, except for the fact that you saw more four-wheeled auto-types than you did planes throughout the movie.